For Schiffman Medical Library at Wayne State University, Detroit. Bronze plaque with four posts on back. Inscribed on the plaque is "William John Stapleton Jr. MD Family Physician friend and counselor to the people of this community for over half a century. Professor of medical Jurisprudence Historian Associate Dean of Wayne State University School of Medicine." 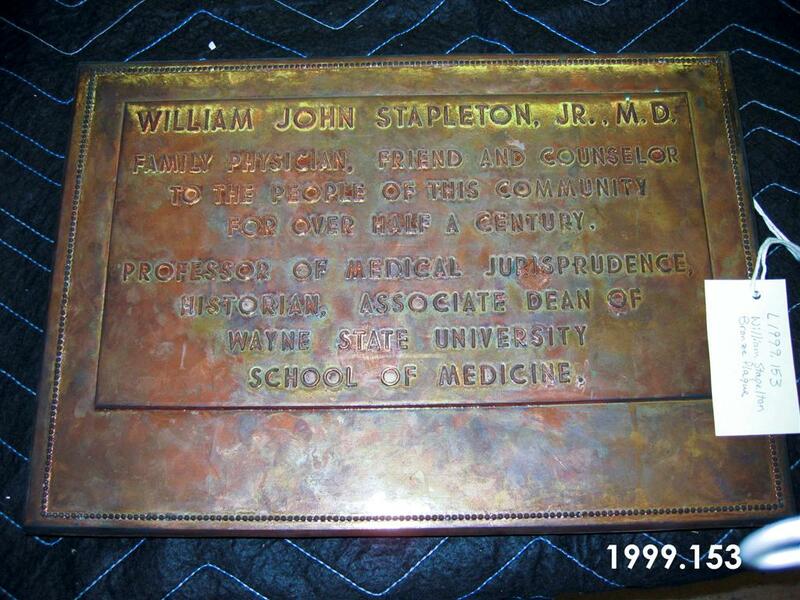 Fredericks, Marshall M., 1908-1998, “William John Stapelton, Jr., M.D., Relief, [Bronze],” Marshall M. Fredericks Sculpture Museum, accessed April 22, 2019, http://omeka.svsu.edu/items/show/5418.